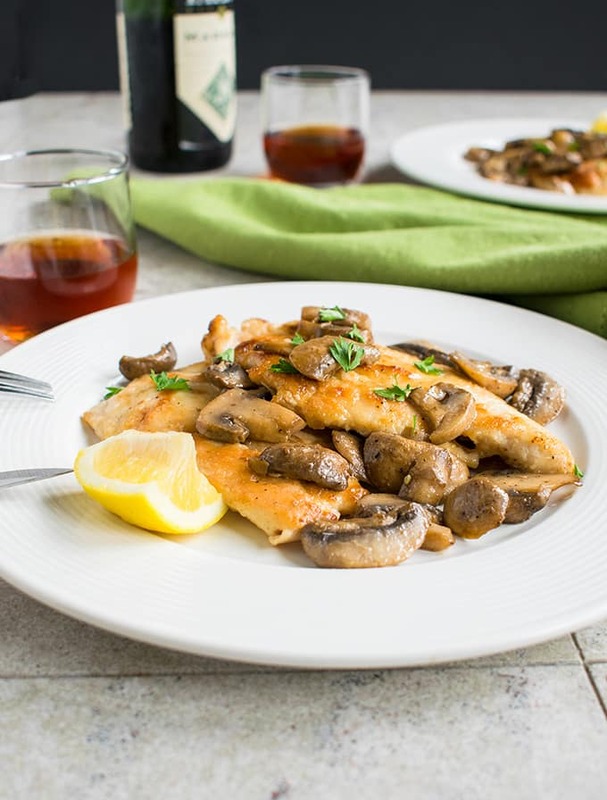 This Easy Chicken Marsala with Mushrooms will knock your socks off! A company-worthy main dish ready in 30 minutes. As kids, my brother and I would stand on one side of our kitchen peninsula (the counter came up to my neck) and watch Mom pound chicken breast cutlets, flour them and sauté them in her electric skillet. We’d anxiously await the moment when any stray bites of hot, tender chicken would be available for the taking, before she added the lemon and wine. It was one of life’s simple pleasures. 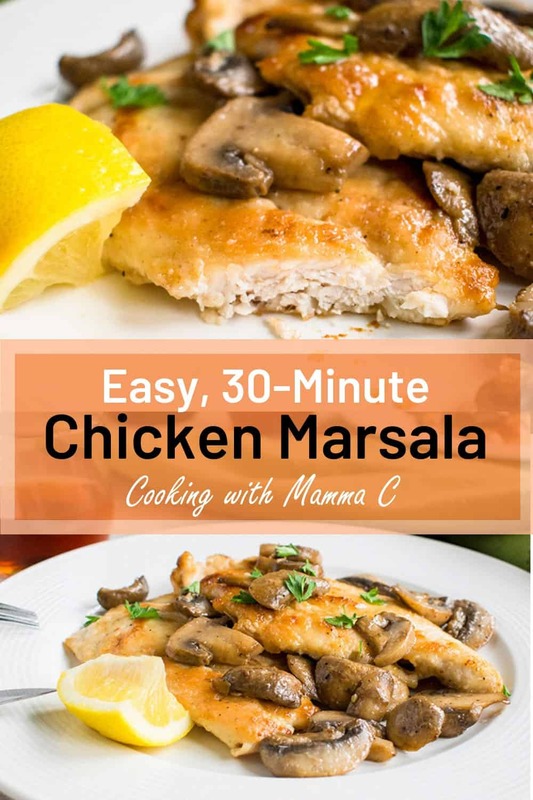 So, when I told Mom I wanted to publish a Chicken Marsala recipe and asked if she knew how to make it, she chuckled. Oh. This is what happens when your Mom’s from Italy. You grow up eating restaurant-quality meals like it’s no big deal. Mom always uses a sweet cooking wine instead of Marsala, and I’ve substituted whatever I had on hand a couple times. But I used the real thing for these photos. Marsala is brownish-red and tastes similar to Port, according to my wine-making hubby. It’s often served with dessert. I went ahead and poured some Marsala in the glasses you see in the photos, so you can get a sense of what it looks like. 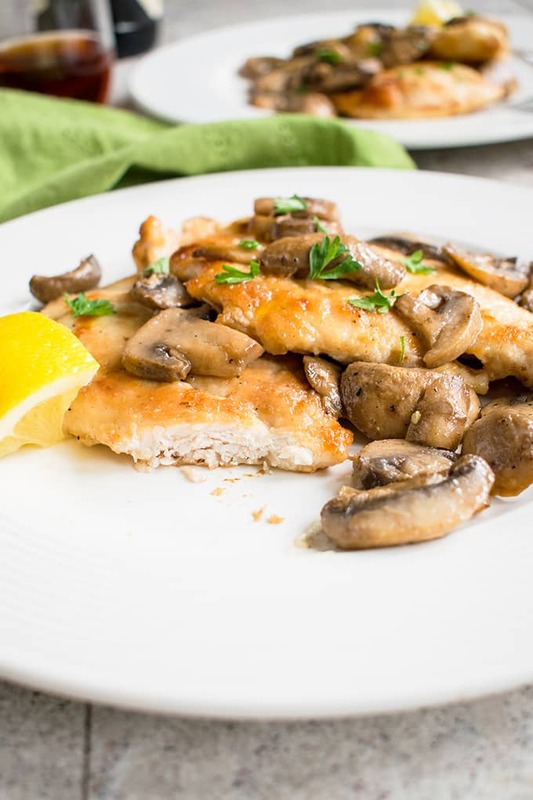 This dish is easy to make, especially if you buy thin, boneless, skinless chicken breasts and already-sliced mushrooms. (Just make sure you choose mushrooms without too much dirt.) Dinner will be ready in 30 minutes and requires only one pan. 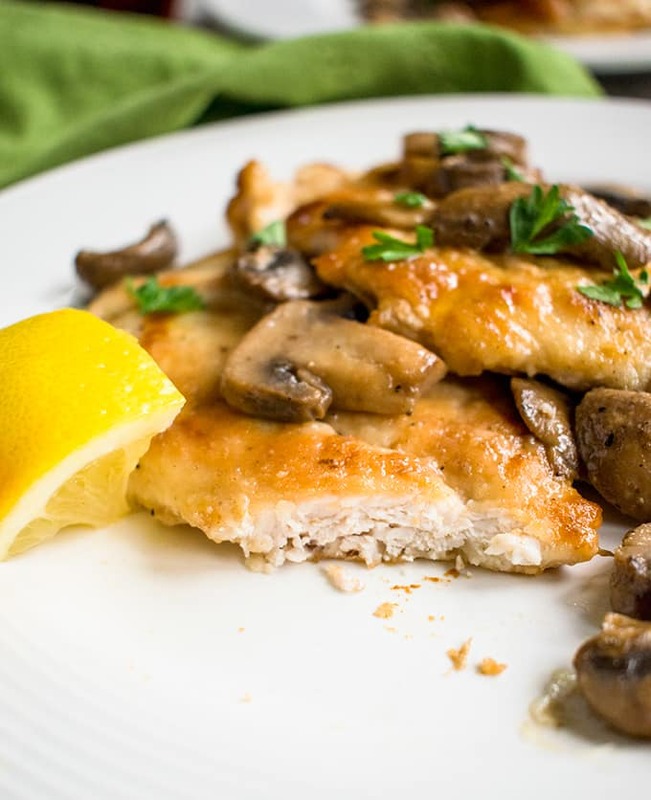 Like Mom, I don’t use any shallots or garlic in my Chicken Marsala. The wine, lemon, butter and oil provide plenty of delicious flavor. And, unlike American versions of this dish, there’s no broth in this recipe. This is company-worthy stuff, folks. You’ll be amazed. It goes great with rice, potatoes or Creamy Parmesan Polenta. If you’ve got time, it’d be fabulous with this Baked Risotto with Asparagus and Spinach. For a low-carb option, serve it with Cauliflower Rice Caprese. 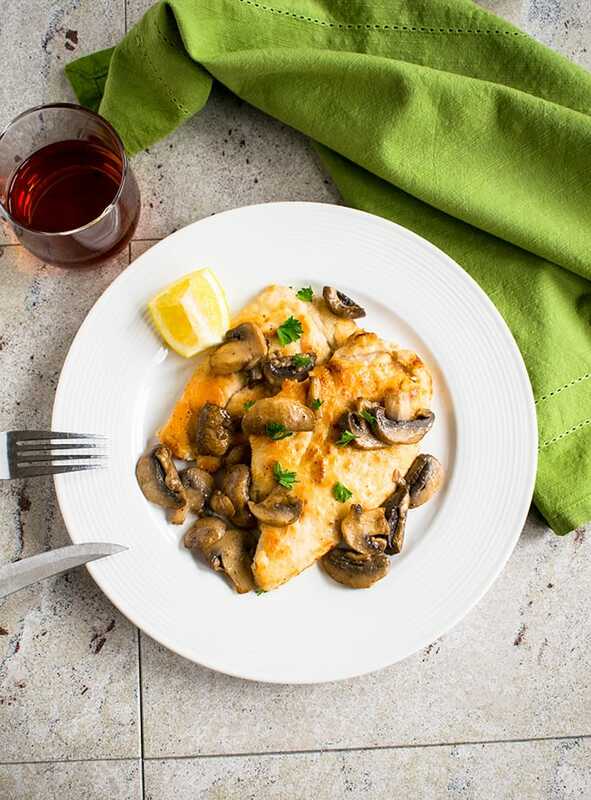 And, if you really want a special meal, this Easy Chicken Marsala can follow a course of Homemade Manicotti. Wear your stretchy pants. Amazing and Easy! I cant cook to save my life. My picky teenage son who wont eat anything I cook ate 2 pieces. My Family iż not a fan of mushrooms, so we used broccoli instead. I’m so glad this was a hit, Brenda! See, you CAN cook! Just realizing that I should check with you. Please feel free to share, Joann! Thank you so much. I finally made this…so easy and so divine!!! Adding to my list of weeknight delights! I love hearing that, Joann! Your picture looked so good. Thank you for letting me know! We really enjoy this. Thanks, Cheryl! Lucky you getting restaurant like meals served at home like it’s no big deal! This looks great! I was very spoiled by my Mom’s cooking. That’s why I lost 15 pounds during my freshman year away at college, Lol! Thanks, Tina. You had me at easy! This looks sooo good! It tastes even better. Thanks, Brandi! This looks amazing as I love saucy dishes, chicken and mushrooms. Will bookmark this to make! I hope you enjoy it, Bintu! Easy meals like this are so great for weeknight meals! Thanks! And the best part is, it tastes like you’ve been cooking for hours. Thanks, Ginny! I have similar memories of my mom making chicken in the kitchen! Great inspiration for your recipe. Those are the best kind of memories. Thanks, Haley.